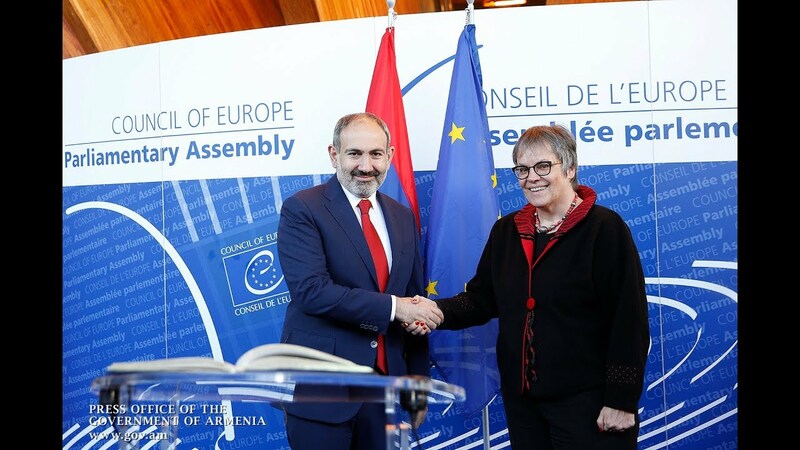 A delegation led by Prime Minister Nikol Pashinyan on Thursday morning started a working visit to Strasbourg to attend the Spring Plenary Session of the Council of Europe’s Parliamentary Assembly (PACE). Upon arrival at the Strasbourg airport, the prime minister was greeted by Paruyr Hovhannisyan, Armenia’s permanent representative to the Council of Europe (CoE), and Hasmik Tolmajyan, the Armenian ambassador to France. The premier will deliver a speech at the Assembly later today and respond to the parliamentarians. He is also scheduled to meet with Council of Europe Secretary General Thorbjørn Jagland, PACE President Liliane Maury Pasquier and President of the CoE Venice Commission Gianni Buquicchio. After private talks, Pashinyan and Jagland will appear with a joint statement for representatives of the media. They will later be joined by the PACE president to hold the official opening of the photo exhibition “Armenian Velvet Revolution” at the Palace of Europe (the seat of the Council of Europe).